The Commerce Department said retail sales in December rose more than analysts had expected, offering possibly encouraging signs that consumer spending may sustain economic expansion. Sales of automobiles dipped, as did five other retail categories, but seven categories gained, led by apparel stores, gas stations and supermarkets. Overall retail sales were 4.1% ahead of the year-earlier pace, slightly below the long-term average. Business added to inventories for the sixth month in a row in November, exceeding expectations though slightly off from strong stocking in October. The Commerce Department reported no change in the inventories-to-sales ratio, which fell recently for manufacturers and wholesalers and suggests lean positioning for future demand. A dip in wholesale food costs somewhat offset the biggest rise in energy prices since June as wholesale inflation gained slightly in December. The Bureau of Labor Statistics said the core Producer Price Index, excluding volatile food and fuel prices, increased the most since July 2012. But the year-to-year measure remained at only about half of the long-term average of 2.3%, suggesting economic growth is still modest enough that inflation is not an imminent worry. The moving four-week average for initial unemployment claims dipped for the second week in a row, appearing to settle down after seasonal fluctuations from post-holiday dismissals. The Labor Department showed jobless claims remaining below the 47-year average, suggesting most employers still don’t want to part with workers if they can avoid it. 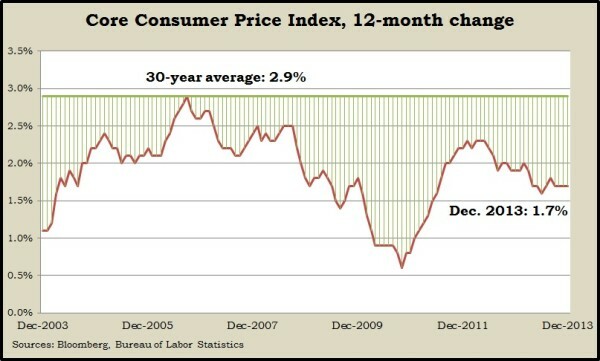 The broadest measure of inflation gained 0.3% in December as gasoline and other energy prices rose. Aside from the volatile fuel and food categories, the core Consumer Price Index was up 1.7% from December 2013, according to the Bureau of Labor Statistics. That remained below the 2% ballpark sought by the Federal Reserve as well as the average rate of 2.9% over the last 30 years. U.S. production capacity was at its highest rate in five and a half years in December. The Federal Reserve said industrial production increased, led by a continued push in manufacturing, which has expanded output five months in a row. The capacity utilization rate of 79.2% stayed below the long-term average, suggesting room for further growth without threatening inflation. The Commerce Department reported continued progress in the housing recovery in December, despite a slightly lower rate of housing starts than the six-year high set in November. For the full year, residential construction grew 18%. Building permits, which indicate plans for further building, also dropped from the November pace but was still up 4.5% from the year before. A preliminary reading of the monthly consumer sentiment index from the University of Michigan and Thomson Reuters showed a setback after two months of rising optimism. The index dipped to 80.4 in early January from 82.5 in December, which was its highest mark since hitting a post-recession peak in July. Some economists look to consumer sentiment as an early indicator of consumer spending, which accounts for 70% of U.S. economic activity.